Office policy is not to keep your details (personal or financial) for any longer than is absolutely necessary as a result we shred quite a lot of paper, for example when we have to write down the details for card transactions the paperwork is shredded as soon as the payment has been processed. The tax man insists we keep the office accounts for eight years, it gives us a lot of loft insulation! And this year we have been shredding the accounts and paperwork from the year ending March 2009 which generates bags and bags of paper streamers which our local recycler won't take. So what can we do with it all? Yep, they're Guinea pigs and shredded paper is perfect bedding for them. 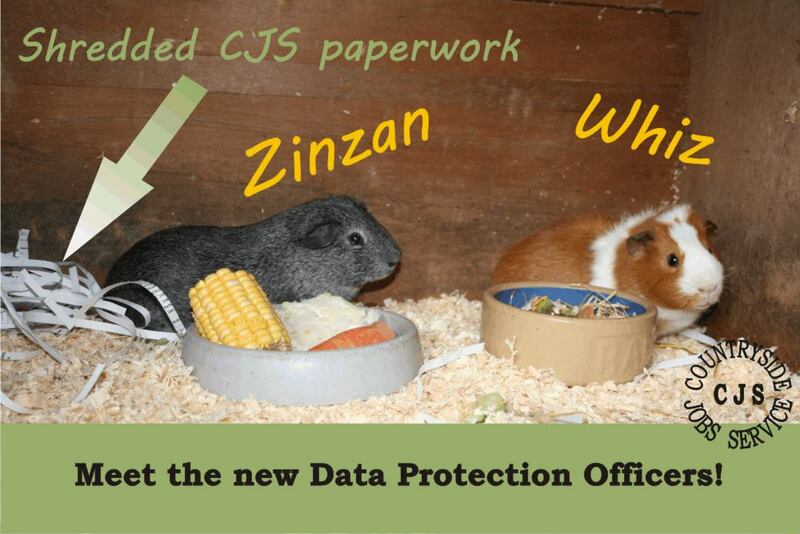 Our previous 'Pig' was mentioned in our Environmental Policy: "All the paper used to produce your copy of CJS is 100% recycled and when you write to us your letters are recycled too, with one exception for security if we have any paper copies of details from the database (your name & address etc) or have written down your credit card details these are shredded and then used as bedding for livestock before being composted – not much chance of identity theft from that, however, if you find a small brown guinea pig is using your card details to buy carrots you’ll know we were wrong! " I think we need to update that to a brown & white, and grey (technically an agouti) guinea pig and their favourite is not carrots but, as you can see, corn on the cob!